three fibrous bands (capsular ligaments) that reinforce the anterior part of the articular capsule of the shoulder joint; they are in continuity with the glenoid labrum at the supraglenoid tubercle of the scapula and blend with the fibrous capsule as it attaches to the anatomic neck of the humerus; they are conspicuous as folds or ridges on the internal aspect of the articular capsule. three thickened bands of connective tissue attached proximally to the anterior margin of the glenoid cavity and distally to the neck of the humerus. Three fibrous bands that reinforce the anterior part of the articular capsule of the shoulder joint; they are in continuity with the glenoid labrum at the supraglenoid tubercle of the scapula and blend with the fibrous capsule as it attaches to the anatomic neck of the humerus. Further to this, Bigliani (16) showed that three failure sites exist for the components of the inferior glenohumeral ligament complex: glenoid insertion (40%), ligament midsubstance (35%), and humeral insertion (25%). Addressing the humeral avulsion of the glenohumeral ligament and subscapularis tear with early surgical repair, and anticipating eventual nerve recovery, allowed this teenage patient to regain normal function and to return to playing football within a year following injury. Arthroscopic repair of a humeral avulsion of the glenohumeral ligament lesion. Ennis M, Taylor JG and Atkinson R (1995): Neural anatomy of the glenohumeral ligaments, labrum, and subacromial bursa. Non-SLAP lesions include degenerative, flap and vertical tears, as well as Bankart lesions, avulsions of the anterioinferior labrum at its attachment to the inferior glenohumeral ligament (Wilk et al 2005). An assessment of the laxity of the inferior glenohumeral ligament. Humeral avulsion of glenohumeral ligaments as a cause of anterior shoulder instability. 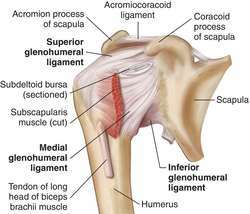 The anterior glenohumeral ligament complex consists of the superior glenohumeral ligament (SGHL), middle glenohumeral ligament (MGHL), the anterior band of the inferior glenohumeral ligament (AIGHL), and the anterior labrum. Normally, external rotation of the humerus creates tension in the glenohumeral ligaments, especially the inferior glenohumeral ligament. Bencardino and colleagues (24) found that SLAP lesions were associated with partial rotator cuff tears in 42% of patients, frayed or lax inferior glenohumeral ligaments in 26%, Bankart lesions in 16%, Hill-Sachs lesions in 16%, chondral lesions in 16%, loose bodies in 10%, complete rotator cuff tears in 5%, and posterior labral tears in 5%.